Discount BATA-2 Pitching Machine - Free Shipping! 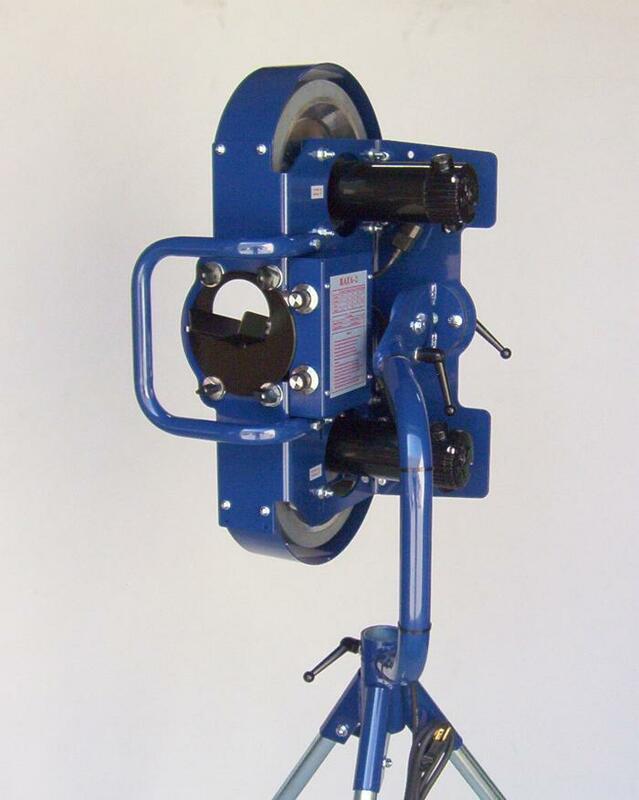 The BATA-2 pitching machine is the same one that the pros use. Pitch every type of pitch a pro pitcher can throw at up to 100 MPH. Our Discount BATA-2 includes a 10 Year Warranty and Ships Free to the contiguous USA. Fastballs, curveballs, sliders, changeups, knuckleballs and everything in between. Capable of throwing grounders and fly balls, it's great for fielding practice and can be purchased as a baseball, softball or combo baseball/softball pitching machine. Built to last for years, the BATA-2 features solid rubber Goodyear Soft Tread pitching machine wheels as well as a heavy-duty solid steel stand and frame. Not only do the tires last longer than air filled tires, they pitch truer, always stay in balance and have a far shorter recovery time between pitches. Capable of throwing baseballs as well as 11 inch and 12 inch softballs, it can throw dimpled pitching machine balls, too! It is powered by any standard 110 volt electrical outlet. For easy unassisted training, you may also wish to purchase a BATA Auto Feeder and a BATA Cordless Remote. Don't forget to get BATA pitching machine baseballs or BATA pitching machine softballs, too - they're virtually indestructible! Powered by any standard 110 volt electrical outlet. BATA-2 pitching machines definitely come with legs. Using the drop-down menu on the product page, you select whether you want the machine to have the longer baseball legs and feeder chute, the shorter softball legs and feeder chute or a combo machine that comes with both sets of legs and both sets of feeder chutes that you swap out with a wrench when changing from one mode to the other. The machines don't automatically come with a quick release leg lock kit because the vast majority of people using these machines set them up once and never transport them. It costs extra money to make the machines with the quick release leg kit included and rather than spread that cost to the majority of people who do not need it, the cost is added to only the people who do need the ability to quickly remove the legs without using a wrench. Similarly, transport wheels are also an optional item. Q: Does the BATA-2 come with the settings card for different pitches and speeds like the Spinball Wizard? A: No, the Spinball Wizard 2 Wheel and Rawlings Pro Line 2 Wheel pitching machines are the only ones that come with a laminated card that outlines the settings for every pitch and speed. A: Ideally, you would want to simulate a real pitch as accurately as possible, setting the pitching machine at regulation distance from the back of the plate (which for older teens and adults would be 60.5 inches for baseball). That allows the pitch to curve its maximum amount before crossing the plate. Of course, that's not always possible in a lot of backyards where space is limited. The amount of curve on a pitch is a result of the speed of one wheel, relative to the spin of another. The speed of a pitch is the combined speed of both wheels divided by two (i.e. one wheel at 80 MPH and one wheel at 50 MPH results in a pitch speed of 65 MPH). In a longer cage, the difference in speed between two wheels does not need to be that great because the ball has more distance to complete its curve (80/60, perhaps). In a shorter cage, you need to make the difference in speed between the two wheels much greater to get it to curve in that short distance (60/20, maybe). Obviously, that means the pitch is going to be slower in the shorter cage to get that desired amount of curve but at the same time, the shorter distance from the machine creates a quicker reaction time (also called "feels like speed"). That 60/20 speed only equates to about 40 MPH when pitched from regulation distance, but because you are twice as close to the "pitcher" at 30 feet away, the "feels like speed" is 80 MPH. Bottom Line: Yes, you can certainly get the ball to curve in a shorter cage. Q: How heavy is this machine, and does it do catcher pop ups? 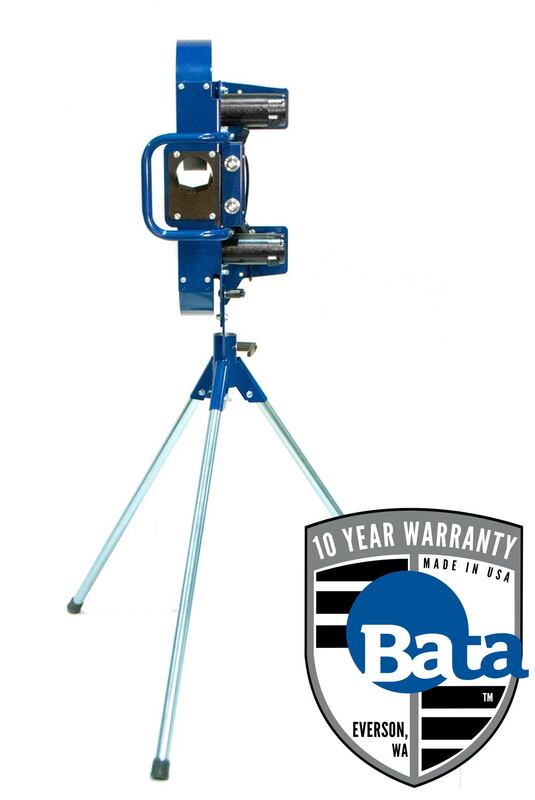 A: The BATA-2 pitching machine weighs about 98 pounds - about 40 pounds less than most JUGS 2 wheel machines. According to BATA Baseball, the BATA-2 can throw pop-ups to a catcher. Keep in mind that with the head tilted vertically, you will have to shove the ball up into the wheels. It is also impossible to use an automatic ball feeder with this (and most) pitching machines for fly ball or pop-up drills because balls cannot roll uphill from the feeder into the machine. Q: Do you accept PO#s from high school baseball programs? A: We are more than happy to include your P.O. on the paperwork for any order but we do not ship anything until we have received full payment. When for whatever reason, schools need net 30 or net 60 payment terms, they do what individual customers do - they select the PayPal Credit (Bill Me Later) payment option which gives them 6 months to pay for the order, interest free, but it ships immediately. Q: Do you have a BATA with 220-240 volt ? A: BATA Baseball only makes machines that operate on 120V AC. They only ship machines to United States addresses. BATA-2 Pitching Machines are not "free to try" and they WILL NOT accept returns of their products unless there is something wrong with them, regardless of the reason. In other words, there is no "satisfaction guarantee" on their products. Any unauthorized returns will be refused and may incur additional charges for return shipping back to you! Every BATA-2 pitching machine is thoroughly inspected and tested before leaving the factory. It is warranted to be free of defects from workmanship and materials for the period of ten years from the date of original purchase. If a part or the entire BATA-2 pitching machine is deemed to be defective, it will be replaced. If the defect occurs within the first 3 years, the part or entire machine will be replaced free of charge and BATA will pay the cost to ship the machine back to you. If the defect occurs after the first 3 years, the part or entire machine will be replaced free of charge and the customer will pay the cost to ship the machine back to them. In either case, customer is responsible for the cost of shipping the part or entire machine to BATA Baseball. On all non-"wear-and-tear" parts, the part will be replaced or repaired free of charge. Tires treads are considered normal wear and tear parts and are not covered by this warranty. The BATA-2 warranty is non-transferable. If you sell your machine, the warranty becomes null and void to the third party. 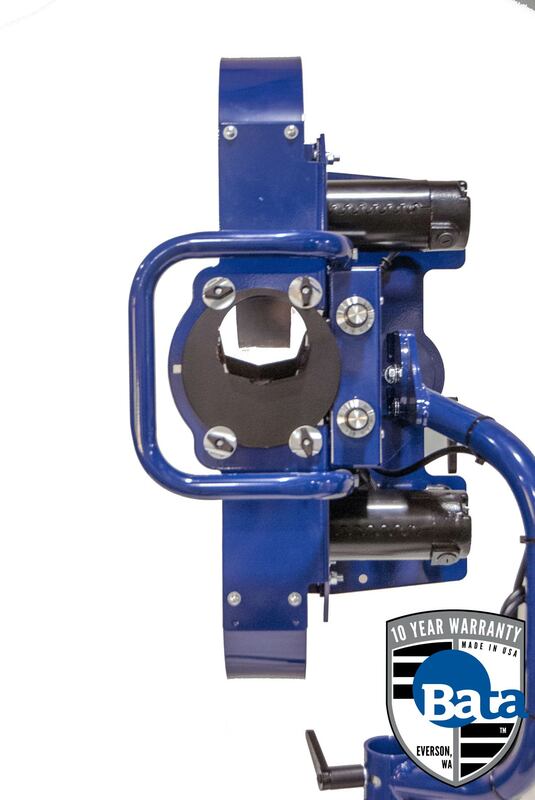 No matter where you order a BATA-2 Pitching Machine from, NOBODY actually stocks them; they all ship directly from the manufacturer's warehouse located in Carlsbad, California. Therefore, the shipping time frame is exactly the same no matter what website you order from (we hope that it is this one!). BATA-2 Pitching Machines typically take 5-7 business days to ship from the time you place your order. They ship via United Parcel Service (UPS) and could take anywhere from a day or two to a week to get to you AFTER being shipped, depending on your proximity to their warehouse. We will notify you of your tracking number the moment we receive it from the manufacturer's warehouse. 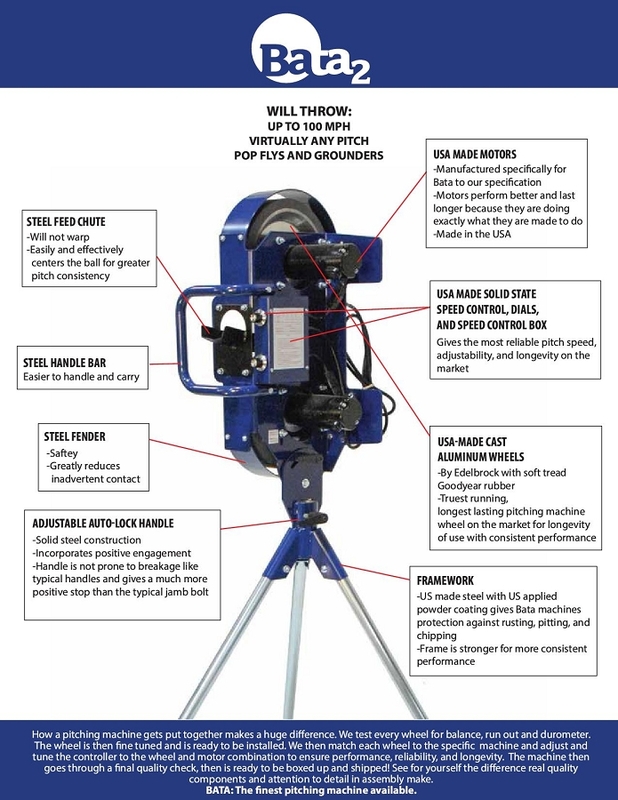 Click here to download an easy to read, printable PDF of the BATA-2 Pitching Machine Owner's Manual.